Ed Perry at the mike at WATD, which he helped start in the mid 1970s. 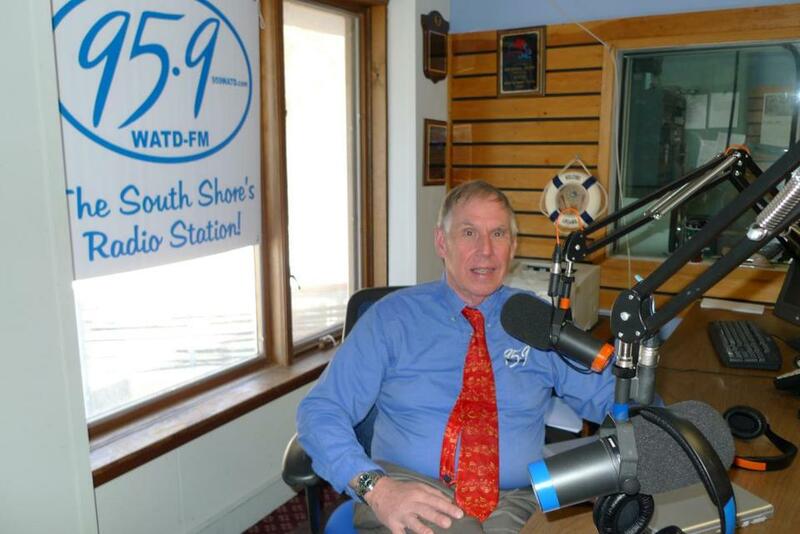 Since 1977, radio station WATD-FM in Marshfield has served, as the owner puts it, “15 or 20 towns south of Route 128, east of Route 24, west of the ocean, and north of the Cape Cod Canal.” That’s primarily Plymouth and Norfolk counties, with a little Bristol thrown in. WATD has three fulltime staffers and depends on freelancers in the communities it serves. It’s never off the air, but it runs no syndicated or automated programming. It has won a slew of awards, including five prestigious Edward R. Murrows for news and feature coverage. At 72, owner Ed Perry isn’t above covering stories himself. He and reporter Steve Dodrill covered the recent home invasion of a Duxbury police officer. “There was a shooting in the middle of the night, and we spent the whole night covering the chase of the guy. We were there when they caught him,” says Perry. Their coverage won the station the 2013 Associated Press Award for regional radio in the breaking news category. “It pays to be there,” Perry says. It’s his motto for covering the community he serves. WATD is lucky to be there, in Marshfield. When Perry wanted to build a radio tower in town in the mid-1970s, he got an option on land near the Marshfield water tank. But residents revolted, and the town bought the land and set it aside for conservation. When Perry looked at a second site, he was again turned down. Then he heard from a woman who had a parcel of land to sell next to the town landfill. When Perry went to the zoning board, residents once again complained. Nearly 200 people showed up. Some said they feared squirrels would fall to their death from the guy wires. One man worried about the geese flying into the tower on their way south. But the zoning board had an attack of common sense, and said yes to the station. “Maybe they finally felt sorry for us,” says Perry, who fell in love with radio as a kid, and worked for the campus station while at Amherst College. In Marshfield, Perry and his crew were so thrilled that they went for a celebratory drink at what he describes as a “combination bowling alley-Chinese restaurant.” They ordered Mai Tais and Scorpion Bowls and discussed what to call the station. Somebody finally suggested naming it after their locale: WATD. We’re At The Dump. “We mailed a letter to the FCC and by the time we sobered up, we had the call letters.” Perry laughs at the recollection. During the Blizzard of 1978, WATD (95.9 FM) announcers would refill the gasoline generators every two hours, and the station was able to broadcast emergency information for nearly a week when so much else was shut down. During the recent Boston Marathon bombings, WATD again filled an important local role. Those sources are the ones that Perry and his staff began calling, to describe what they saw out their office windows. They spoke to state legislators from south of Boston and talked about what it meant for the state and area. Like any radio station worth its call letters, they got discussions going: How much would the bombers succeed in curtailing American freedoms? Would there be X-ray machines at grocery stores now? “Sometimes I get yelled at, but it’s really fun,” Perry says. For instance, WATD recently recorded a mock trial at the federal courthouse in Boston, sponsored by the Massachusetts Bar Association. “It’s for kids who want to be lawyers to get out and practice in a courtroom,” Perry says. He’s proud to add that the Marshfield team made the semifinals. WATD is a family affair. Perry’s wife, Carol, has been there since the start. With a master’s degree in economics, she’s the one who reminds Ed that “it’s actually a business and not a hobby.” Their daughter Katherine anchors newscasts and produces news features, including some for NPR and WGBH. Two years ago, she won an Edgar R. Murrow award for a story she did on going to the town dumps in Duxbury and Wellesley, which often yield great finds. Their youngest son, Will, works halftime, helping with the website and keeping the computer systems going. Oldest son Franklin is coming on board soon to help with radio sales.